Guildford, a bustling town at the halfway point between London and Portsmouth, is full of expensive properties and modern shops. In 2007, it was voted the 12th best place to live in Britain and is known as one of the best places in Britain for shopping. However, Guildford is also home to many old buildings, including Guildford Castle, a fortress that dates back to the year 1066. Where there are old buildings, there are bound to be ghosts. Philip Hutchinson has been interested in ghosts his entire life. He is on the Council of The Ghost Club, which was started by Charles Dickens in 1862 and is the world’s oldest paranormal society. 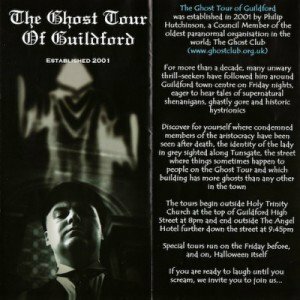 In 2001, he created The Ghost Tour of Guildford in order to show the town’s citizens and tourists the stories that he had collected. The tour has become incredibly popular since it first started, garnering crowds of up to seventy participants in the summer and has been featured in many documentaries and television programs. This eerie expedition, which can last about an hour and a half, covers twenty haunted and mysterious places, each with their own unique stories. On this tour, which passes through Guildford High Street, North Street, Tunsgate, The Castle Grounds and Quarry Street, and finishes at The Angel Hotel, you will be able to visit the sites of some of Guildford’s most haunted buildings, including The King’s Head pub, which is known to have more than one resident spectre. Some participants have even reported their own ghost sightings during the tour! These outings run every Friday night after Good Friday and stop in November. There is also a tour every Halloween, as well as private bookings that can be arranged for other dates. The haunted walk starts in Guildford High Street at 8:00pm, outside of the Holy Trinity Church near Sainsburys. Philip Hutchinson has been involved in many ghost hunts and has been credited in several books on paranormal happenings and local history. He has also written his own novel about the phantom citizens of Guildford, called Haunted Guildford. This thrilling look into the haunted history of this town gives the details of the ghosts and apparitions that live there and is full of photographs and illustrations of the spooky locations. Ghost stories have been present in cultures around the world since ancient times and are still a very popular genre today. Phantoms have always fascinated people, and, thanks to writing, we are able to record these stories and share them with others. For those lucky writers who are going to be participating in the Junior Authors Writers Conference on Sunday, May 18th, why not arrive early and take a haunted walk around Guildford? These curious accounts of the dead might give you the encouragement you need to write your own spooky stories. Philip Hutchinson used the spirits around him as inspiration for his own phantasmal work, and you can too. Who knows? You might even see a ghost while you’re there!